Ubuntu 12.04 LTS, code-named 'Precise Pangolin', the 4th LTS release of Ubuntu, will be supported for 5 years on the desktop as well, where it used to be supported for 3 years on the desktop and 5 years on the server with all the previous LTS releases. It would bring hardware updates for the first 2 years of support, via regular point releases, thus keeping the product up to date with hardware changes and a further 3 years of support in the form of maintenance updates. Canonical seems to have recognized the increasing demand for Ubuntu desktops in corporate environments where longer maintenance periods are normal. 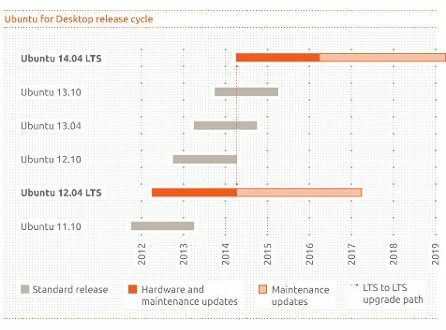 Canonical has also recognized that 70% of the server users are deployed with LTS versions of the product, and as the desktop versions are reportedly similarly popular in businesses, they are now bringing the same extended support on the desktop as well, to keep it in line with the server versions. Ubuntu has always been known for its ability to keep pace with the latest applications and hardware. But as our user-base grows and matures the ability to plan for the longer term is vital. Ubuntu 12.04 LTS will give desktop users the perfect combination of keeping pace with hardware changes and extended support depending on their needs. Ubuntu 12.04 will be released in April 2012, and thus will be supported till April 2017.